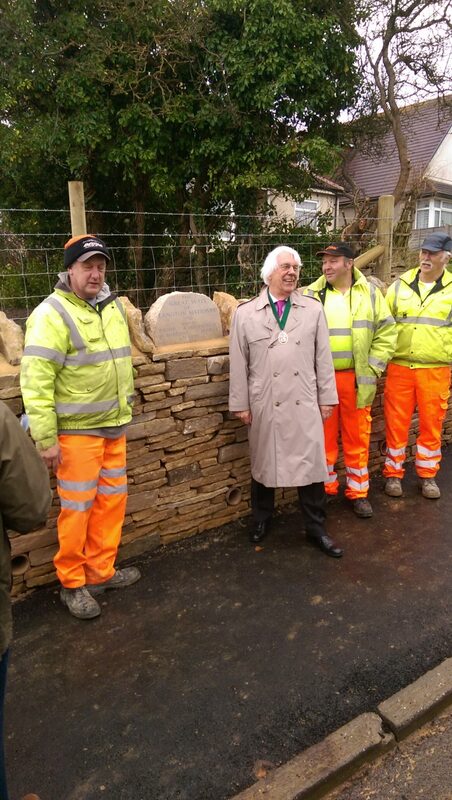 Langton Matravers Parish Council > Latest Parish Council News > Latest News > Great Wall of Langton – Grand Opening ! On 8th December 2017 a small crowd assembled at the new wall and pavement at Putlake to witness the unveiling of a commemorative plaque. The plaque was commissioned by Henry Staveley-Hill and made by local sculptor Valentine Quinn. The occasion was an opportunity to thank all the local residents and landowners who allowed the new part of the pavement and wall to be constructed on their land, and also the Dorset County Highways team, led by Steve Palmore, who undertook the nine-month long project and whose names are inscribed on the plaque. Many thanks to everyone for their patience during the work: the traffic lights are now gone and the road is clear !